On behalf of the San Jose Astronomical Association, I am pleased to announce the recipient of the 2016 A. B. Gregory Award. 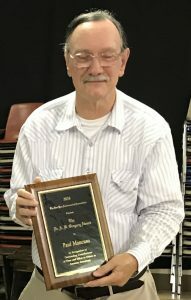 The award is a plaque which reads “In Recognition of Outstanding Contributions of Time and Effort to Others in Amateur Astronomy”, and I can think of no one in the SJAA who deserves it more than Paul Mancuso. Paul is in the top three longest members of the SJAA, joining up in the early 1970s. He was a member of the Board of the Directors from 1983 to 1993, then again from 1996 to 1998 and did one more stint from 2001 to 2003. He was Vice President from July 1988 to March 1993, and then again from 1997 to 1998. In addition to these formal administrative roles, Paul has been a stalwart with the School Star Party program, rarely missing a night at a local school to use his scopes to bring the night sky closer to area students, faculty and their families. Paul has also been a reliable regular participant at In Town Star Parties and Solar Days at Houge Park and other local venues. Paul usually finds his way to the general meeting, or to Auctions and Swap Meets and other SJAA events. When he does, I make a point to come over and say Hi, and see what he’s been up to. It’s great to have him around, and for so long, too, not to mention all his participation and effort he puts into the SJAA. Paul, thank you for all you do, and congratulations on being the 2016 A. B. Gregory Award recipient! You can find more information about the award, a list of past recipients, and information about Dr Gregory and the past recipients on the website.